While the past week has played host to a series of leaks and rumours, we're now able to confirm the official specifications of the new Shield tablet, a specialised Android tablet that specifically targets gamers. The Shield tablet features an 8-inch, Full HD IPS LCD display and a pair of front facing speakers. 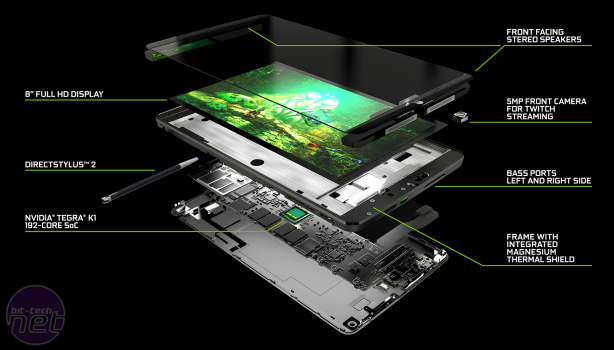 It's powered by Nvidia's own Tegra K1 system-on-chip, which the company touts as the world's most powerful mobile processor. It comprises 192 CUDA cores, four ARM Cortex A15 processors and a Cortex A9 'shadow' processor to keep things running in standby and low power states. The main cores are clocked at 2.2GHz and the SoC is paired with 2GB of DRAM. The Kepler architecture of the GPU cores mean that the tablet supports DirectX 12 and OpenGL 4.4. Nvidia will be launching two SKUs: a 16GB, Wi-Fi only model and a 32GB one with added 4G/LTE connectivity. Both are expandable with up to 128GB of storage via the micro SD slot. Bluetooth 4.0 is also included, as is a pair of 5 megapixel cameras – one front, one rear. There's also a 3.5mm headphone jack with microphone support and a mini HDMI output. The Shield tablet comes in at 126mm x 9.2mm x 221mm (W x D x H) and weighs 390g. For comparison, the current iPad Mini measures 134.7mm x 7.5mm x 200mm and is 341g. Nvidia boasts that there are now over 400 Shield-optimised Android games available, all of which can be accessed via the pre-installed Shield Hub app. Furthermore, there are 11 games specifically designed (or redesigned) to run on the Tegra K1, one of which, Trine 2, will come pre-installed on every Shield tablet. The other ten games are Half Life 2, Portal, Anomaly 2, Pure Chess, The Talos Principle, War Thunder, Fluhunter Origins, Dungeon Defenders, Chuck's Challenge 3D and Rochard. Screenshots supplied by Nvidia indicate that they will run at 720p, and the company has promised that more Tegra K1-optimised games are inbound. That said, the Shield tablet isn't just limited to playing games using its own processing power. It's the world's first tablet with Nvidia's GameStream technology, allowing you to stream and play your own PC games over Wi-Fi or LTE, provided your PC is using an Nvidia GeForce GTX 6XX GPU or later. The new tablet can also be used with the Nvidia GRID cloud gaming beta, though this is sadly limited to just Northern California residents for now. The Shield tablet also has the claim of being the world's first game-casting tablet, as you're able to live-stream your own gameplay via Twitch, including an overlay of your own face thanks to the front-facing camera, should you so desire. 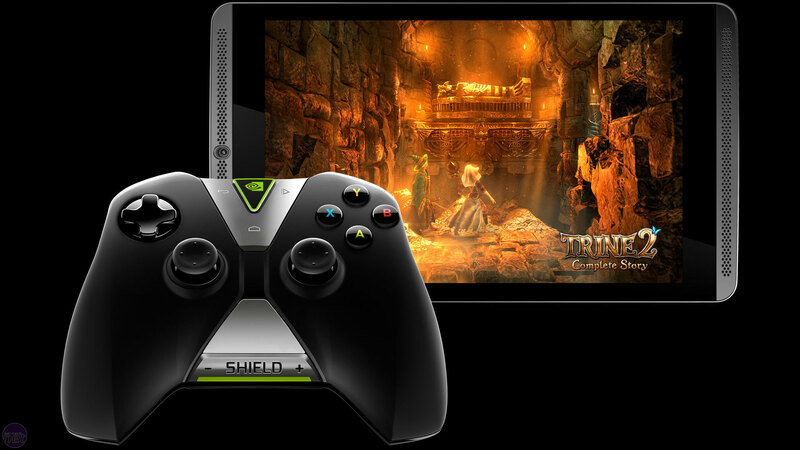 Finally, Nvidia will be using the Shield tablet's wireless connectivity to provide regular over-the-air software updates. Accompanying the Shield tablet are two optional accessories, the main one being the new Shield wireless controller. This connects to the tablet using Wi-Fi Direct connectivity and features a rechargeable battery, a headset jack, a touch pad, volume control and the ability to use simple voice commands (e.g. “watch Iron man 3”) to control the tablet. The second accessory is a basic stand (also a screen protector) which can support the tablet when you're using a controller to play on it. The mini HDMI 1.4a output means you can connect your Shied tablet to your TV in Console Mode, and it supports the pairing of up to four controllers on one device meaning that local co-op or competitive play is also an option. Naturally, you can also use this mode to watch TV via Netflix, for example, in Full HD, no less. Has the Shield tablet piqued your interest? Let us know your thoughts in the forums.